For quantitative determination of glutamate and evaluation of drug effects on glutamate metabolism. Glutamate is an important chemical in general metabolism. It is also a crucial mammalian neurotransmitter that is believed to be involved in a number of neurological and psychiatric disorders such as lateral sclerosis, lathyrism, autism and Alzheimer’s disease. Glutamate is also widely used as a flavor enhancer in the food industry. Simple, direct and automation-ready procedures for measuring glutamate concentration are very desirable. 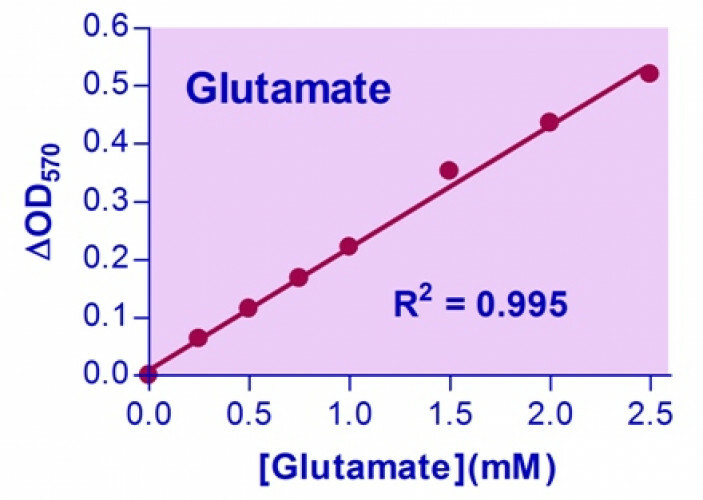 BioAssay Systems’ EnzyChrom™ glutamate assay kit is based on glutamate dehydrogenase catalyzed oxidation of glutamate, in which the formed NADH reduces a formazan (MTT) Reagent. The intensity of the product color, measured at 565 nm, is proportionate to the glutamate concentration in the sample. 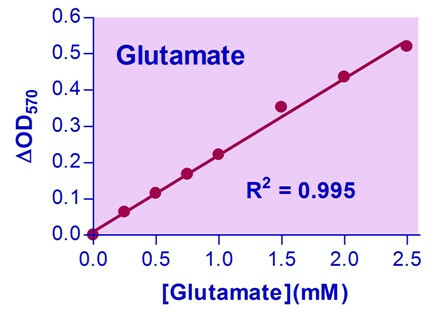 Applications For quantitative determination of glutamate and evaluation of drug effects on glutamate metabolism. References Assay: Vector in E. Coli (Pubmed).